It’s not often that we dedicate an entire post to one mug, but in the case of the CM8414 Two-Tone Ceramic Mug, it’s entirely warranted. Introduced in the Fall of 2012, just in time for corporate holiday sourcing, this unassuming mug turned out to be the sleeper product of the season, and a true king among mugs! At a whopping 15 ounces, this isn’t a mug for the faint-of-heart coffee sippers – this is a mug for coffee gulpers! Take a walk on the wild-side and try printing along the handle for a twist on traditional branded mugs! Use branded mugs as place settings at conferences and meetings – this large mug will be especially appreciated at early morning meetings when a serious injection of caffeine is in order! TIP: Order larger quantities to reduce your per-unit cost and increase the value of your investment. Besides, it’s smart to keep extra promotional items on hand for unexpected or last-minute opportunities. 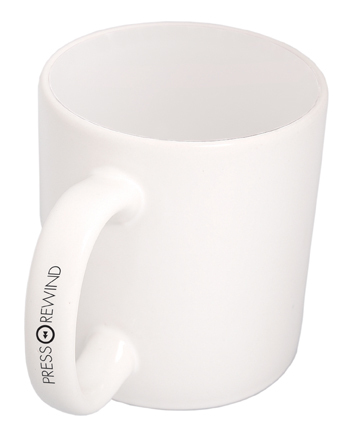 For what is only a nominally higher price, the CM8414 Two-Tone Mug has a quality and perceived value that far outweighs similar, smaller, single-toned ceramic mugs. How much is your brand worth? Do you consider it a worthy investment to spend slightly more for a superior product? For more product information, or to learn about the plethora of decorating options available for this mug, leave us a comment below or contact your Sales Representative. Click here to see our full line of ceramic mug options. This entry was posted in Drinkware, Product Spotlight and tagged 15 OZ. 'C' Handle Two-Tone Mug, branded drinkware, branded mug, c-handle, Ceramic Mug, corporate gift, Drinkware, Eco-Friendly, giveaway idea, office culture, Reusable Mugs by Debco. Bookmark the permalink.